Dartmouth College researchers have used advanced 3D printing to unlock the key to converting microscopic nanorings into smart materials capable of performing work at human-scale. Nanomachines have been known to deliver medication and serve as computer memories at the small nanometer scale. Researchers used a 3D printing technique pioneered at Dartmouth's Ke Functional Materials Group to unlock much greater potential for these mini-machines. The research was published in the March 22 online issue of Angewandte Chemie, the renowned journal of the German Chemical Society. Up until now, harnessing the mechanical work of nanomachines has been extremely difficult. We are slowly getting closer to the point that the tiny machines can operate on a scale that we can see, touch and feel. Ke provided an example in which a dime weighing 2.268 g was lifted by the first-generation smart material. The coin was 15 times the weight of the structure that lifted it and was raised 1.6 mm, equal to a human lifting a car. The new material’s design has been based on Nobel Prize-winning research that transformed mechanically interlocked molecules (MIMs) into work-performing machines at nanoscale. Researchers have earlier demonstrated how heat, light and altered pH levels were capable of forcing movement within a structure called a rotaxane, which comprised of rings on a molecular axle. Just as how beads are threaded onto a string, the shuttling – or sliding - of rings along the axle results in molecules changing shape and storing energy. The paper reveals that MIMs are already widely used as pumps, muscles, switches and molecular shuttles. However, chemists have been hindered for years by the issue of ordering their random positions. Establishing such order is essential to keep the structures from canceling out one another’s mechanical movement in order to amplify their molecular motions. Our work provides the first design principle to add 3-D printability to nanomachines. Importantly, we have also transformed molecular motions to macroscale to do useful work. Ke did his post-doctoral research with one of the 2016 Nobel laureates, Sir Fraser Stoddart. 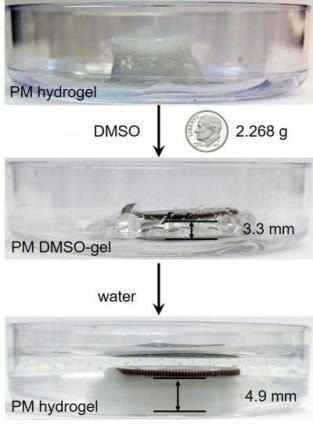 MIM-based gels with properties suitable for 3D printing were designed and synthesized by the researchers. The research group employed the hydrogen bonding interactions between nanorings and successfully printed lattice-like 3D structures. Crosslinking of the axles resulted in the development of excellent 3D structural integrity and mechanical stability. Researchers discovered that the complex 3D architecture of these structures can be reversibly deformed and reformed via solvent exchange that switches the threaded ring structure between random stationary and shuttling states at the molecular level. The researchers discovered this shape-changing and recovery behavior to be repeated effortlessly many times. Just like moving beads to strengthen or weaken a string, this action is critical because it allows the amplification of molecular motion into macroscopic motion through the conversion of chemical energy input into mechanical work. Qianming Lin, Graduate Student, Dartmouth College. Ke and his team of researchers believe that this advancement will allow scientists to create smart devices and materials. For instance, the addition of contraction and twisting to the rising motion will result in the possibility of using molecular machines as soft robots that complete difficult tasks similar to that performed by a human hand.